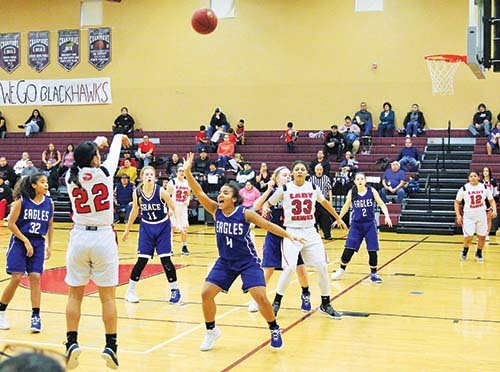 The Tulalip Heritage Lady Hawks basketball team finished the regular season with a (15-4) overall record, including a perfect (12-0) in league play. Going undefeated against league opponents earned them the #1 seed in the NW1B District playoffs. Tulalip started the postseason by hosting the Lions from Cedar Park Christian in an opening round game played on February 1. It was obvious from the onset that Tulalip was the much more talented and all-around better team as they took a 5-0 lead, extending it to 13-0, before the Lions finally got on the board right before the end of the 1st quarter. After the first eight minutes of play Heritage led 15-3. During the entire 1st half, senior guard Keryn Parks put the offense on her back by routinely attacking the basket, finishing through contact, and scoring bucket after bucket. In fact, Keryn scored an impressive 18 points in the first half, outscoring a Cedar Park team who only managed 7 points through the first two quarters. In the 2nd half, forwards Deandra Grant and Krislyn Parks controlled the game by exploiting the smaller Cedar Park team in the paint. The Lady Hawks played through Deandra and Krislyn who were able to get quality looks from point-blank range. It was a dominant performance from the Lady Hawks as they won 62-20. They were led in scoring by Keryn’s 26 points, while Deandra added 11 points and 18 rebounds, and Krislyn had 13 points and 13 rebounds. Two days later, Tulalip travelled to Lummi High School to play Grace Academy in a 2nd round playoff game. The 3-ball was falling early on with guards Georgie Randall and Loralei Eli knocking down multiple shots from deep. At the end of the 1st quarter, the Lady Hawks led 15-10. In the 2nd quarter, the Lady Hawks were hit foul calls left and right, none bigger than Keryn getting her 3rd personal foul in the early going. Due to that foul trouble Keryn hit the bench and in her absence the team stepped up admirably. From that point on the team’s defense locked in and didn’t allow Grace Academy any easy looks. Meanwhile, the coaching staff adjusted their offense to run everything through Deandra in the post. With Keryn on the bench, Deandra shouldered the offensive burden with ease. She was often double and even triple teamed, but it didn’t matter. She was just too big and too strong. Deandra scored 18 points from the 2nd quarter on. 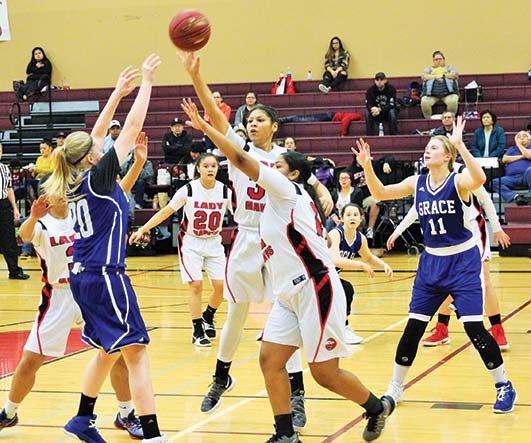 Combine her scoring with a Tulalip defense that was locked in, they held Grace to only 5 points in the 2nd quarter and then an astounding 1 point in the 3rd quarter, and Heritage ran away with a 60-34 victory. Deadra led all players in scoring with 20 points, including double digits rebounds and blocks, while Georgie and Keryn both chipped in 11 points. The 2-0 start to the postseason gives the Lady Hawks a berth in the NW1B Championship game where they will play Mt. Vernon Christian tonight at 5:00 p.m. at Lummi High School. 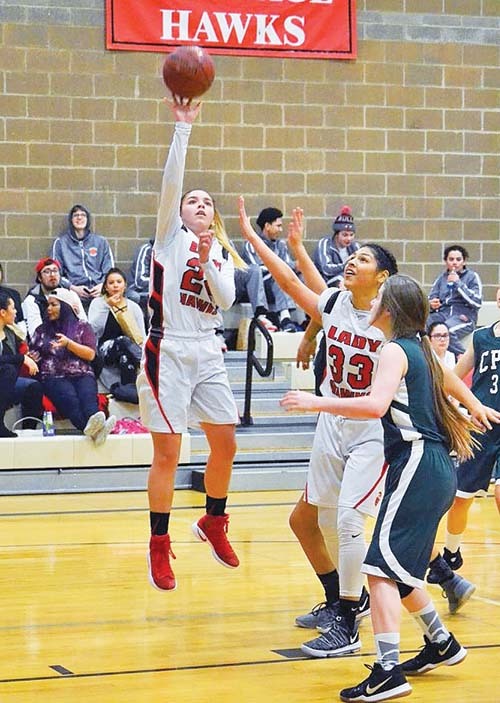 This entry was posted in Sports, Tulalip News and tagged Basketball, Lady Hawks, Tulalip Heritage High School by Kim Kalliber. Bookmark the permalink.